My initial thought that Despite Yourself was going to be the pinnacle of season one were blown out of the water with The Wolf Inside. Burnham is fully undercover as her Mirror self although she is beginning to lose herself within the facade. While this isn't a wholly evil universe she is struggling to come to terms with the casual racism, slavery and the brutality that the Terran Empire has brought to the galaxy. 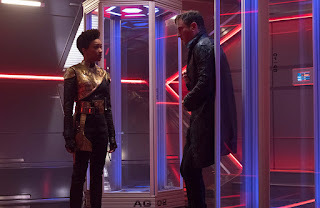 Tyler is proving to be her only support since Lorca (whom we see very little of and may be compromised) is still locked away in the Agoniser booth. 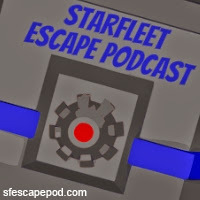 The challenge Burnham faces is to pass the heavily encrypted data files on the USS Defiant and its passage to the Mirror Universe back to the Discovery and has that weight added to with the Empire demanding the destruction of a suspected rebel outpost. 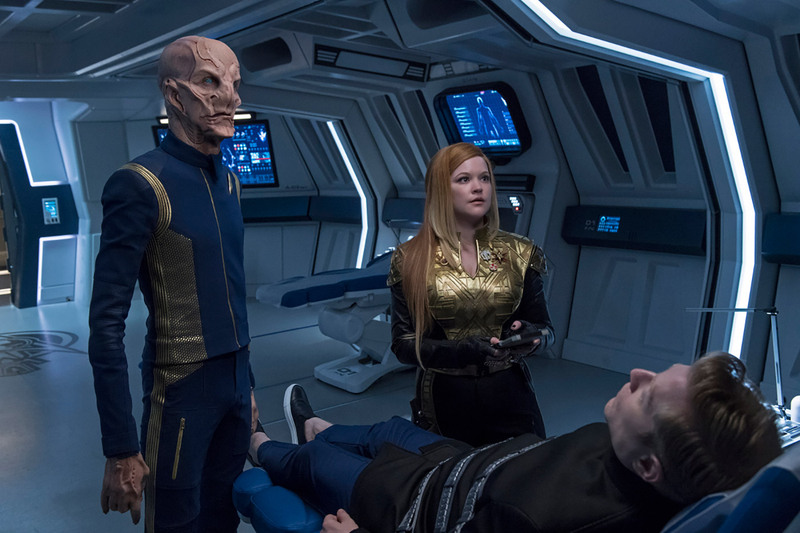 Burnham sees an opportunity to reach out to the rebels and save them in return for an understanding of how the alliance of Klingons, Andorians, Tellerites and Vulcans was formed. When Burnham and Tyler do get down to the surface and avoid being blown apart by the rebel forces, they discover that the fabled "FireWolf" is in fact Voq, the Klingon we saw back in the first trio of stories as the Torchbearer and heir-apparent to T'Kuv'ma. Also there, suitably goatee-adorned is one Sarek of Vulcan aka The Prophet. He confirms via mind-meld that Burnham is telling the truth about her origins however Voq's words manage to activate whatever has been laying dormant within Tyler. Of course the reimagined Andorians and Tellarites are as big a draw for fans in these scenes as that legendary Mirror Universe beard and I think that the makeup artists of 2017 have done a stunning job in adding their own twist to these classic Star Trek aliens. Heck, the Tellarites get better every time they're resurrected. Yes, it's finally out that Tyler is Voq (picture to the right via Entertainment Weekly). 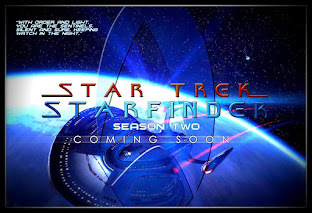 The Starfleet version goes hell for leather at his rebel-leading Mirror self but the real issue chimes in when we get back to the ISS Shenzhou because the facade of Tyler slips and the Klingon comes to the surface, attempting to kill Burnham and only being stopped by slave Saru. The fight is great as are the more graphic flashbacks to Voq's transformation into the traumatised Starfleet security chief but after all the ramblings of the internet it does feel that Discovery's worst kept secret is a bit of a let down because, well, we all worked it out back in episode four. 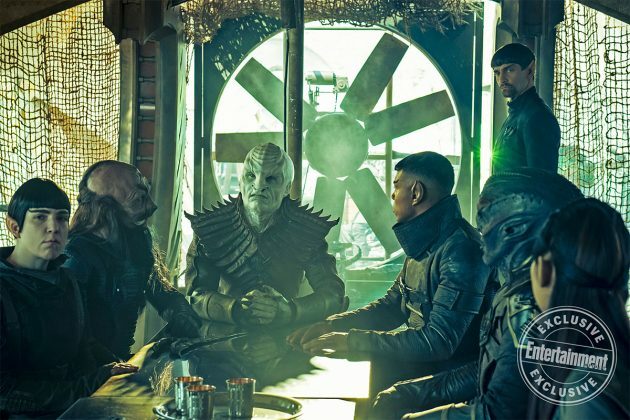 The Mirror Universe isn't quite that straight mirror that The Original Series made it out to be because here we see the strain of maintaining that false front, to act like the "savages" we might believe them to be. Burnham is placed in a horrible situation and looks certain to circumvent genocide however the arrival of the Emperor puts paid to that. The roles of her and Lorca are totally flipped within this Mirror Universe arc with the captain and prisoner in opposite places. 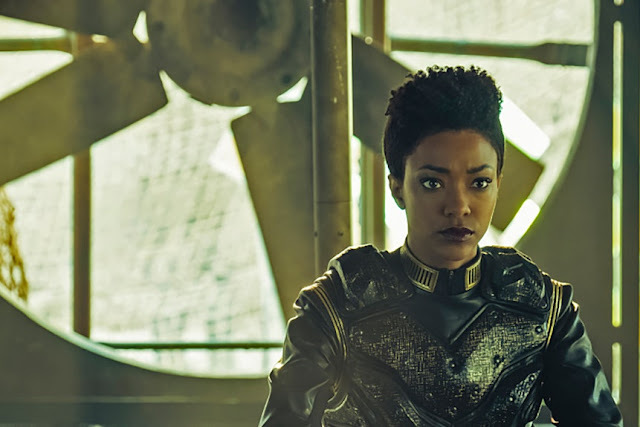 Sonequa Martin-Green is the driving force behind this episode, commanding a dark starship, facing the news that her lover is not what he seems and, erm, that final one which really screws with her world. 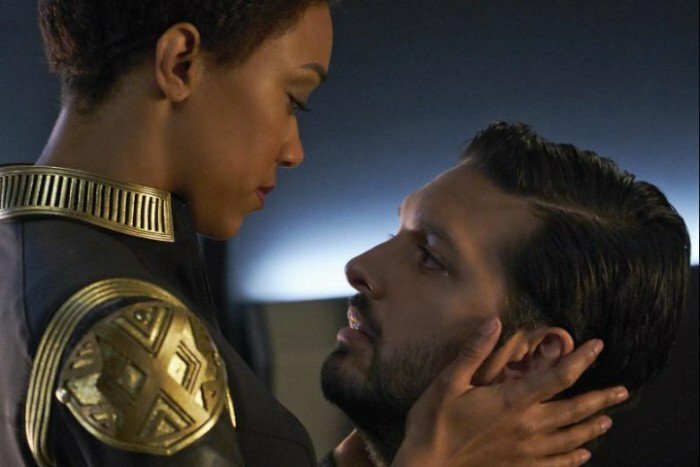 With Burnham's life being pulled down around her, the tour de force of the episode comes from Shazad Latif as Ash Tyler. My god this guy is pushed to the limit playing a range of both Tyler and Voq's aspects as well as, effectively, playing both the sides of the character on screen in the same episode. The sequence in which he finally trips into Voq is truly chilling as his Klingon beliefs and motivations come to the fore. Breathtaking. The Mirror Universe given the life it is here is being given the chance to breathe more than ever and for us as the viewer to explore more than ever before. The inclusion of the nameless Saru here and the systems of contempt in operation drive home the darkness but at its core, is The Wolf Inside really about seeing past the layers to what's really at the heart of us all? In a literal sense the title is shouting out the plot twist around Tyler/Voq (Wolf inside...get it? Voq's the WOLF inside...yeah...you see where I'm going...) but it also betrays what might be lying deep within Burnham too. Her action to sentence Tyler to death may have an alternate reason to it however there's not even a flicker of regret when he gets spaced. It's a far cry from her voiced concerns during the diary entry at the start of the show (and part of the longest pre-titles sequence ever?). 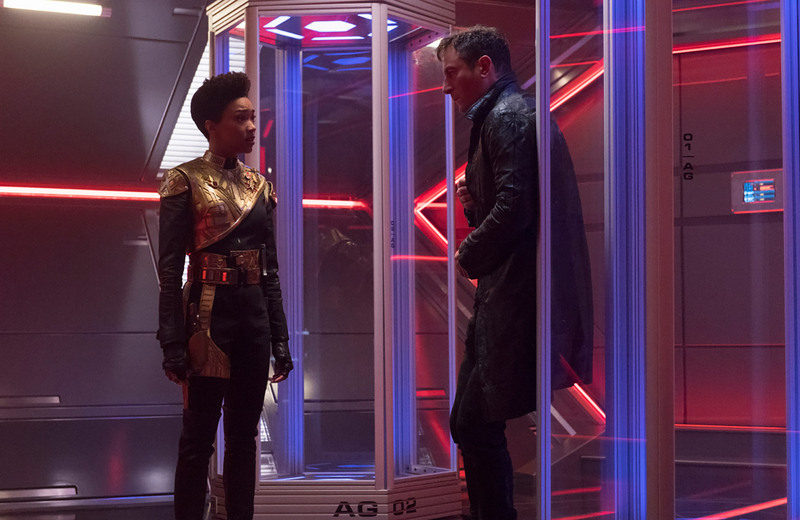 Plus there's the fact she omits to tell Saru on the Discovery about his Mirror self while he in turn decides not to reveal that Culber is dead allowing that to be left to the vengeful Tyler/Voq. 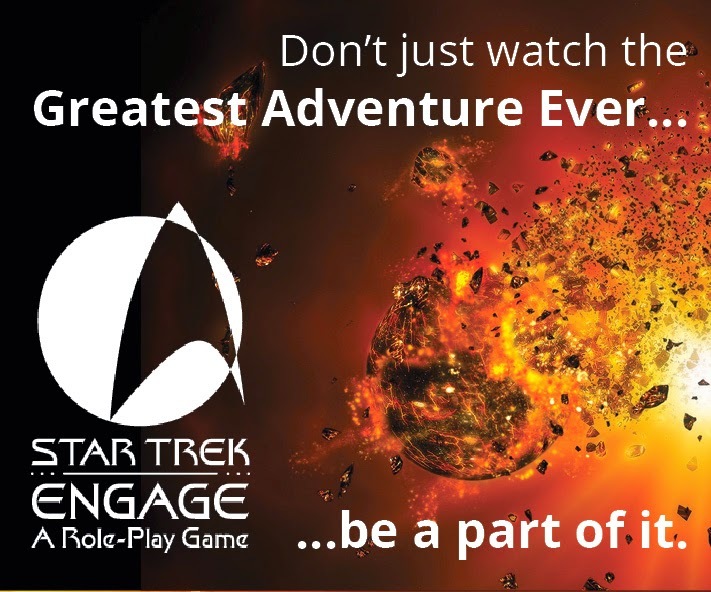 Cleverly it seems that the main characters are taking much darker turns in personality since crossing over and the reorientation back to normal life on the de-Empire'd Discovery could be a treat to behold. 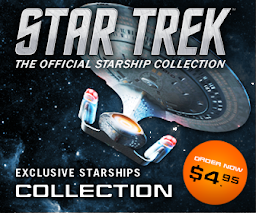 While all this is going on aboard the Shenzhou, Saru is left in command of the eponymous starship and allows Tilly to attempt to save Paul Stamets. The lieutenant is at the cliff-edge after discovering that Culber has been murdered (Tyler admits this to Burnham before trying to kill her) but Tilly believes that she has the solution to bring him back. Her answer, probably one of the most technobabble filled explanations of the whole series, at first looks set to get her on the command track but ends up killing Stamets. Never fear because he's soon back to life however he's out on the mycellial network and encountering his alternative self. More on that I suspect, next week. 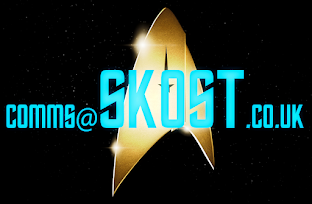 It is a much smaller part of the episode but the final scene of Saru and Tyler plus the speech which he gives the troubled officer/Klingon is one of the best of the series to date and reminds us just what Starfleet is about even though the ship is stranded in a morally-corrupt universe. If there was doubt about how the writers' room sees Star Trek this was the 30 seconds that proved they know precisely what they are on about. 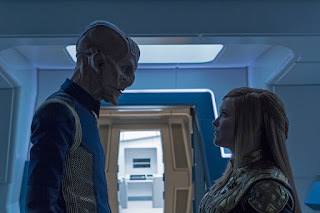 On another note it's important that we see Saru in this command role given just how much indecision and troubles his last attempt at command was when Lorca was captured by L'Rell. 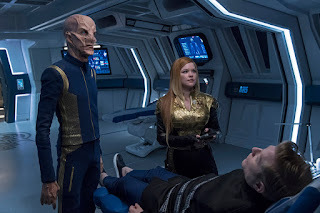 He has come on a great deal although there are still a few seconds of wavering judgement in there around whether or not to provide medical aid to Stamets or allow Tilly to get her way however it's a far cry from where he was. From the pacing and the feel of the episode I suspect we might be in the middle of a min-arc that will come to an end next week ahead of the final three episodes that will, I would think, close off the Klingon War and the Voq storyline. While The Wolf Inside is a great indulgence episode that gives a lot of nods to fans, there are some inherent issues with it which come from the two plot twist revelations however amazing they are on screen. They are, sadly, predictable because of the wonders of the internet in regards to Tyler/Voq and because, well, it just had to be that character as the Emperor didn't it? I mean, there was such a big thing made about That Person being included in the cast! As stated already though, the decision not to drag these "revelations" out any longer is a wise move and viewers will appreciate it. How do you rate The Wolf Inside? 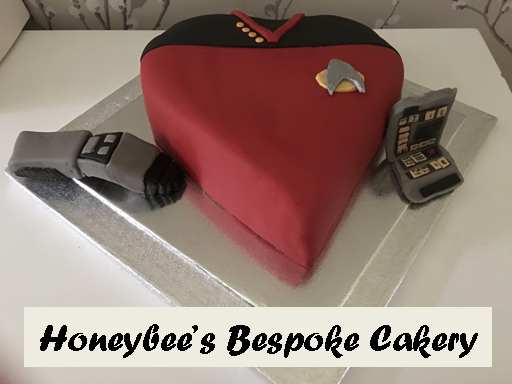 Predictable or gloriously indulgent Star Trek?